Please Note : Despite every effort to photograph these stones accurately there are some colours that do not show or come out wrong in the photograph. Each stone has a snakeskin pattern of intense colours that change from neon green to neon orange. The only way to see how the stone really looks is to buy a sample. These Lab created opals match the chemical properties of natural opal, but the impregnated patterns are resin to attempt to simulate the fiery patterns found in natural opals. 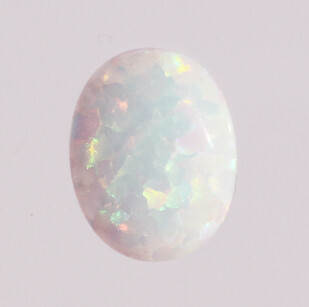 This makes them look different to natural opals which have more intricate patterns which cannot be replicated synthetically.